Made from a core of rigid polyamide fabric with layers of PVC on either side. These systems are applied to protect spindles, shafts and columns and the optical fibre in laser machines. Nylon fabric with layers of PVC. Steel hoop for large bellows. 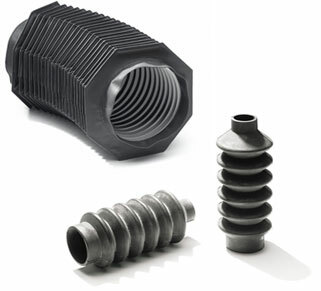 Support for fastening bellows to machine. Collar for fastening to the machine. In the system with steel frames, the anchoring type and anchoring holes must be specified by the customer. 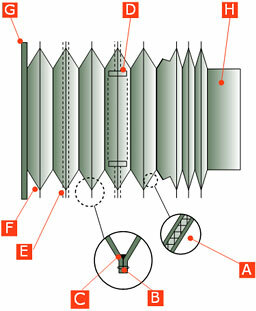 In systems where Velcro is used to fasten the bellows, one side is joined to the end frame of the bellows and, the other to the frame of the machine.